Publishing on 14th December 2018. 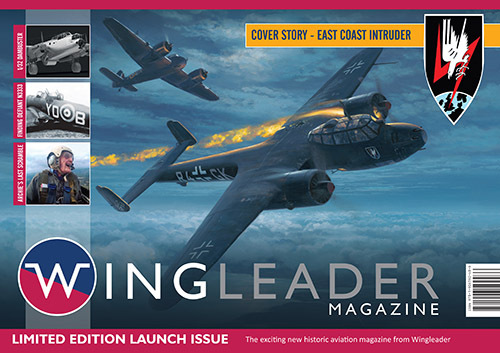 In an age where aviation magazines are becoming more and more limited in their range of content in an attempt to stick to subjects that sell, Wingleader Magazine will cover the broadest range of interests, such as aviation modelling, archaeology, art, books and of course history. Wingleader magazine will be a FREE monthly digital download magazine with a quarterly printed compendium edition which contains the articles from the past three digital issues. This limited edition Launch Issue is a one-off printed version which shows how the quarterly compendia will look and feel. With the highest printing standards found in other Red Kite / Wingleader publications, this special Launch edition is bound to become a collector's item in the future. So, a new aviation magazine with a broad range of articles, predominantly based around WWII military aviation but with a freedom to delve into WWI, Gulf War, Classic Airliners and even the Reid and Sigrist Snargasher if the story is interesting enough! (C) WingLeader 2018. All rights reserved.